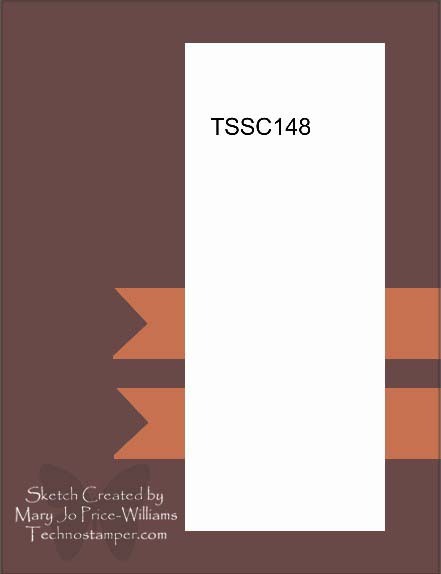 Top Three for sketch 149! Monday Lunchtime Sketch Challenge 149! Top three for sketch 148! Monday Lunchtime Sketch Challenge 148! Top three for sketch 147! 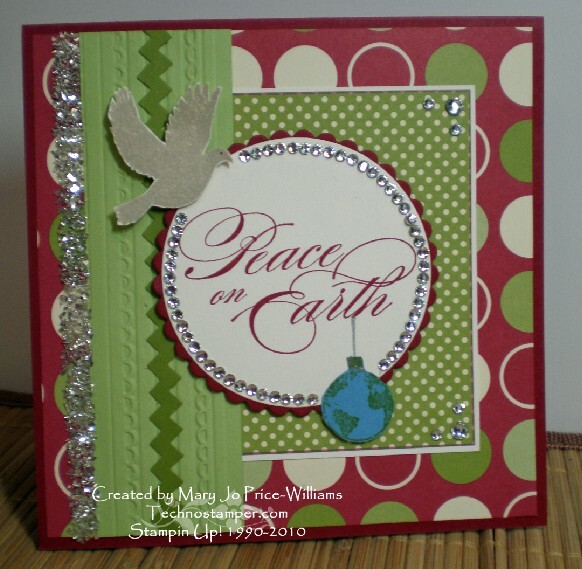 Bling on the Blogger's Challenge! Monday Lunchtime Sketch Challenge 147! 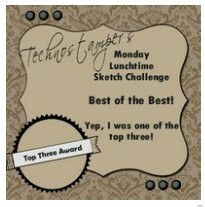 Top three for sketch 146! Royal Blog Tour Clues 3 and 4! 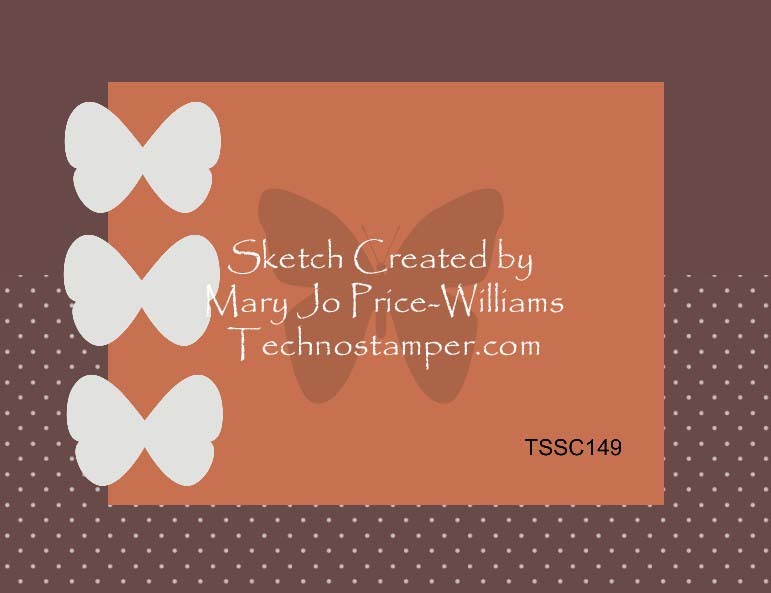 Here they are, my top three picks for sketch 149! In no specific order. It was a hard pick this week. Lots of great samples. Be sure to click on each of the preview pictures below to be taken to the original post and the full card sample. While there why not leave a nice comment for the ladies?! Beautifully done again this week ladies! Please feel free to add my winner's button to your blogs. 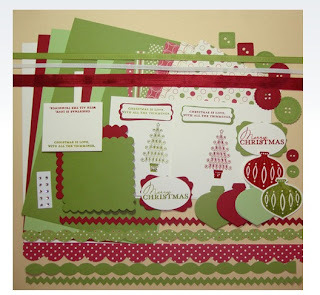 This week's blogger's challenge is to use the following color combo. 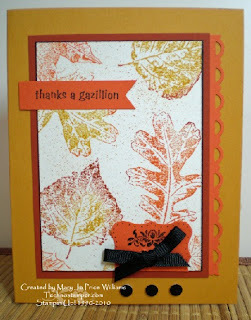 I really did not feel like doing a fall card since we are seeing snow here so this is what I came up with, not sure how much I like the sponging--I am so NOT good at that, lol! 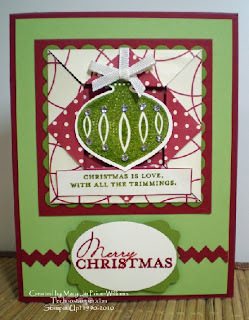 And by the way, I did not forget about the two tutorials I said I would post, just got a bit busy with the excitement of the holiday. Hope you had a great Thanksgiving (my American friends)! and may you continue to have a wonderful weekend. 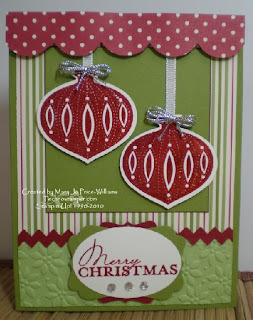 I finally got to use some of those red snowflakes! 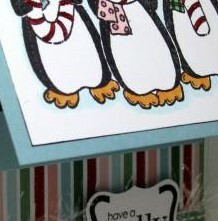 I was not sure what to do with them but they look cute on this card to bring out a bit more of the red. 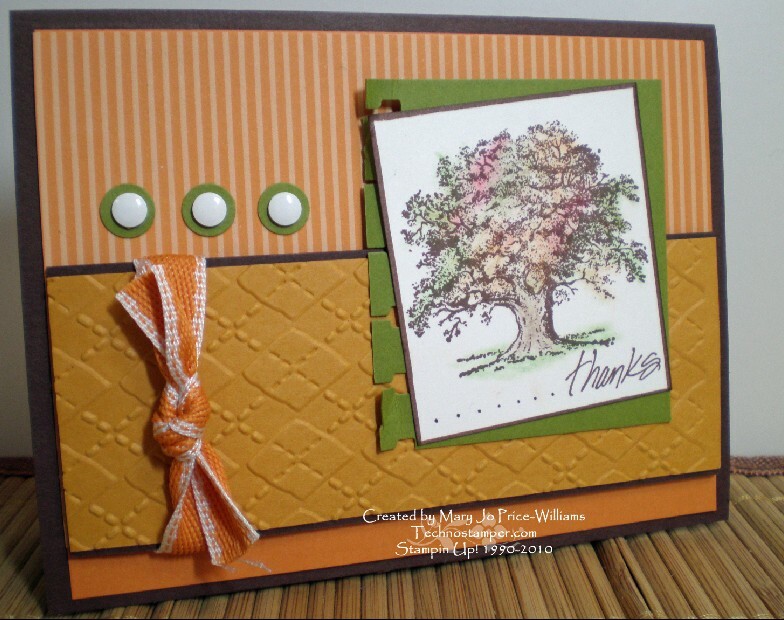 Stamps: Scenic Season and one of the seaside sketches for the sentiment. The letters are from the retired alphadots set, they fit perfectly in the build a brads. I hope you have time to play along this week--I can see so many great possibilities with this sketch. Remember to come on back and leave your link below so we can all view your projects. Thanks so much for stopping by today, may you have a blessed week! 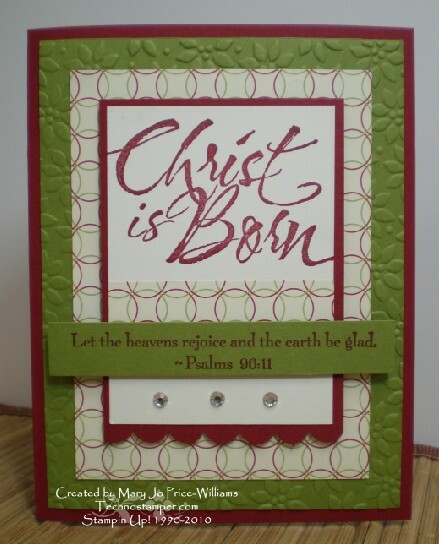 Wow, the time seems to go faster and faster--someone slow it down, can you believe we are already to Thanksgiving. YIKES. I am excited to share my top three picks for this last week's sketch. They are in no particular order and don't forget if you click on the sample you will be brought to the creators original post with the full card. Please consider leaving them a comment, they really are talented. Beautifully done this week ladies! Please feel free to add my winner's button to your blogs. I love to take time to sit back and think of all the things I am thankful for, it really make you remember just how blessed we are. 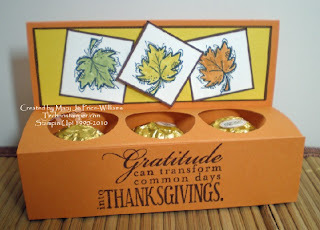 This week Lisa gave us a thanksgiving theme to work with. 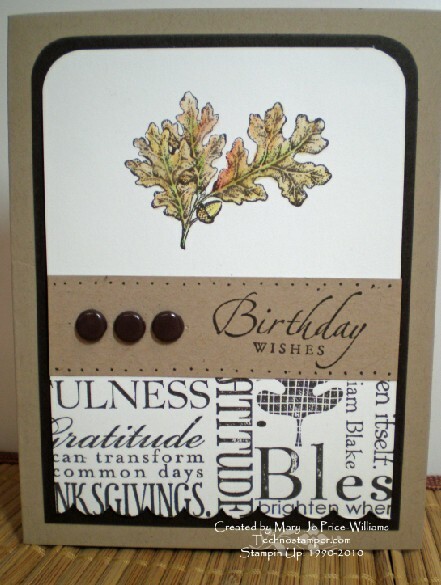 This first card may look like a birthday card but it has the Bright Blessing at the bottom and it is actually a thanks for being you card for a male on his birthday. 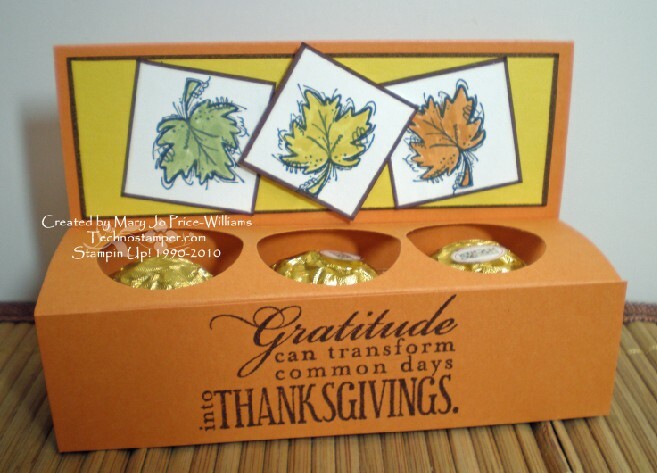 What better time to let someone know how thankful you are for them. 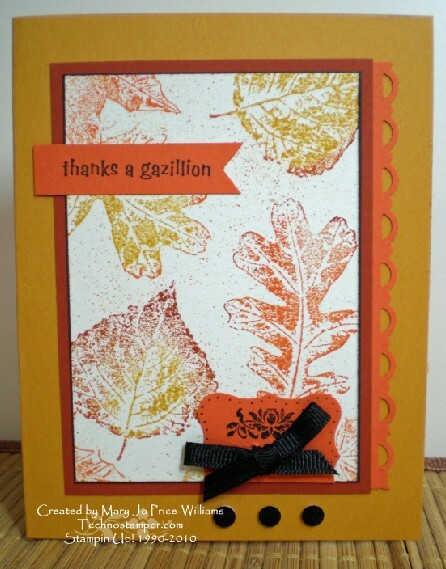 This next card is just a fun fall thank you. I love these colors. 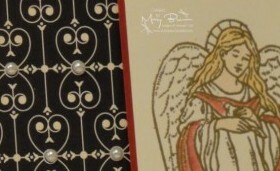 The stamp set is retired but we have a new one out that is very similar. I really wanted the new one but could not justify since I have this one and a few others just like it, lol! So I just pulled this one out again and pretended it was new! 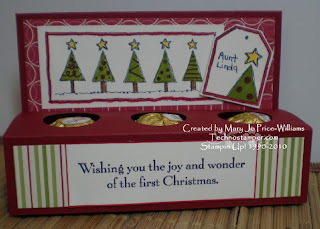 And finally another one of those treat boxes (see the Christmas one made into a place setting HERE). These are so cute and easy too. I will be posting a tutorial by tomorrow night. Don't forget you can see all the projects the other players made by clicking HERE. There is a ton of talent in this group so it will be well worth your time. 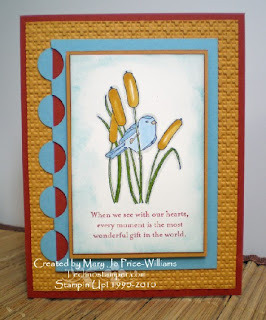 This week's Latenightstamer's challenge was to use something sweet on your project. 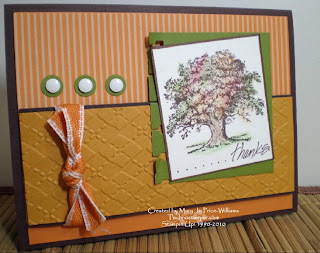 It could be a stamped image or as I chose a real sweet! I have two projects for you. This first one I just love. Although it was a bit of a pain to get to the candy to stay laying right and twist but it was worth it--simple but yet elegant and cute! How is that for a combo?! 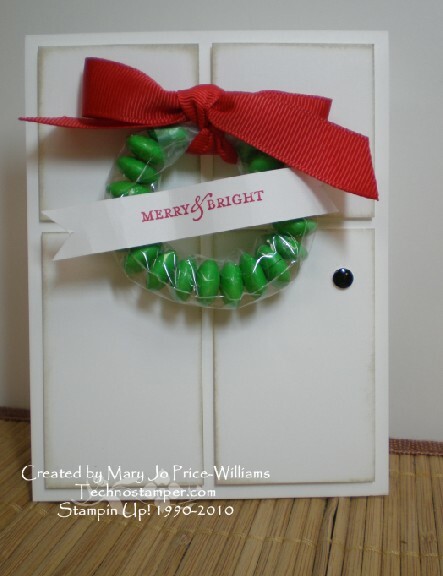 I used the 1/8 bags that have been so hot and filled it with green M&M's. Isn't it just adorable. My son wants me to send it to him so he can eat it, lol! 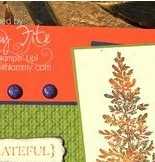 This next project is a table place card/treat. Such a simple and fun project. 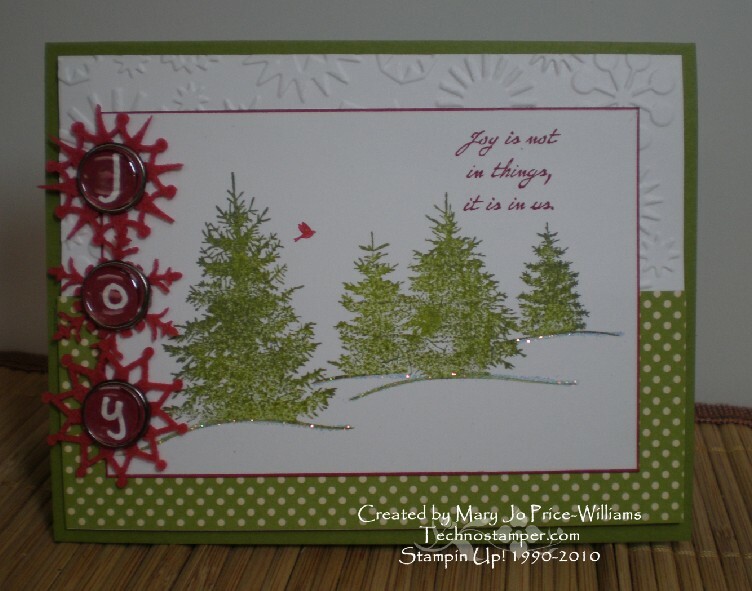 I was not thinking and used a retired stamp--don't know why I was thinking it was still current. Sorry about that but it is the idea that counts, right? Let me know if anyone is interested in a tutorial for this. I can do one up pretty fast if you do. Hope you are having a great week! I have been super busy but what is new! Can you just imagine how long it took her to do this for a bunch of us. We love you Rose, you crazy girl. She is always over the top on things like this. She also enabled me to by that big trim die I swore I would not, lol! Go figure, lol. Anyway, here are the cards I made with the supplies. 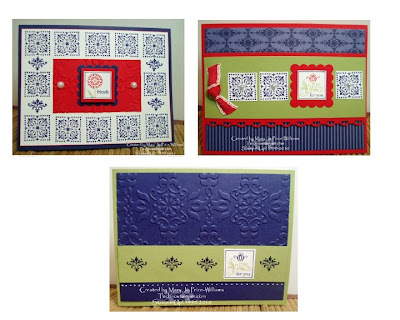 Other: embossing powder, rhinestones, lots of punches, embossing plates and big shot dies. Thanks so much Rose for all the fun! You ROCK! 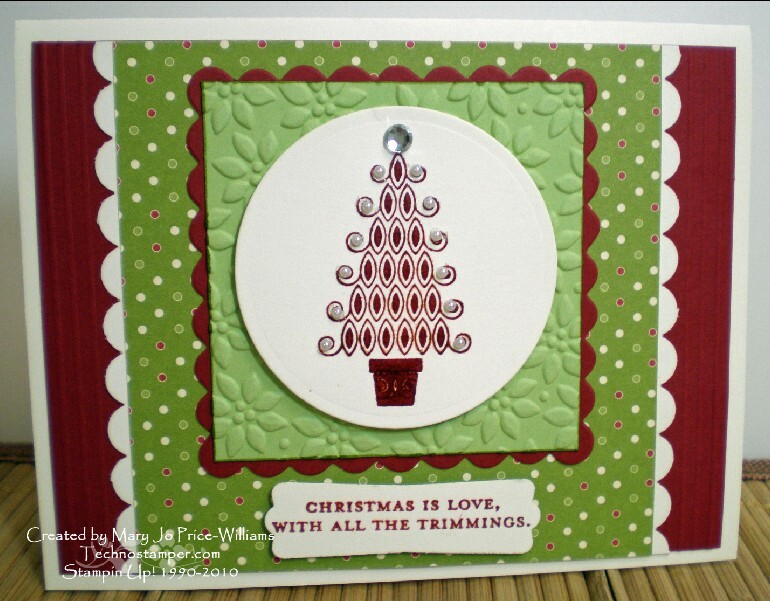 It is a super basic one this week, so I made a simple but elegant Christmas card with it. I chose to tilt the sketch on it side for my sample. 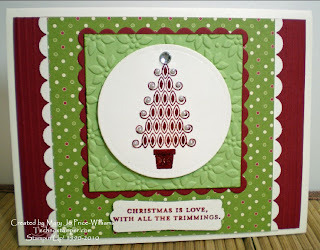 I am not sure why I don't do too much heat embossing except at Christmas time. It is such a simple and beautiful technique. 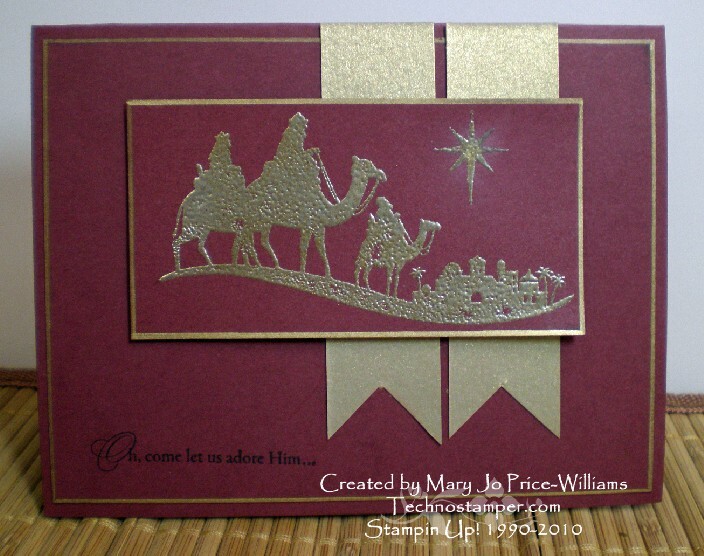 I have tons and tons of the Bravo Burgundy so I will be using it a lot on Christmas cards this year. Don't forget to link up below if you play along. Please try to link to only your sample for the challenge and not your home page. It is so hard to find the post if people don't look immediately. Thanks so much. Hope you have a fabulous week! Not too many players this week, but there were some awesome samples. I appreciate you guys playing along. Thanks so much. 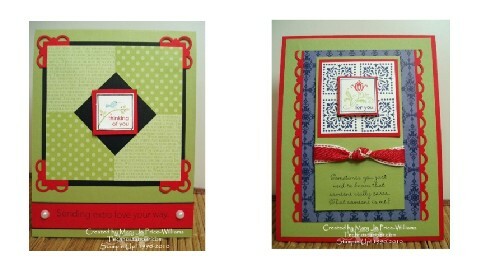 Here are my top three for the week! 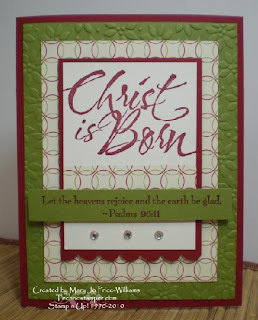 Remember you can click on the preview images to be taken to the creator's blogs and the original post with details. Great job ladies. Please feel free to add my winner's button to your blogs. Yippee! I can play this week. The Royal Blog Tour is over and I am back to doing what I love on Friday--the Blogger's Challenge! This week Lisa gave us a sketch! I love sketches. 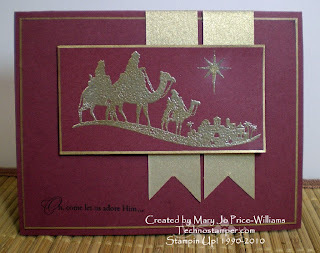 And I just got a new stamp set and some new glass glitter--WOW this stuff is way cool! Do you think I over did it with the bling? I love Christmas. 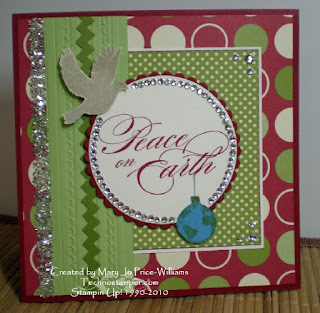 What a fabulous idea this is--Peace on Earth! Hmmm, maybe I should send this to someone higher up, lol! 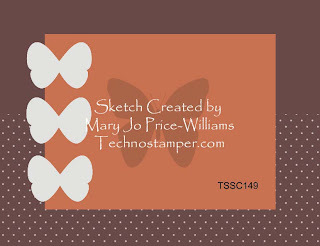 Don't forget you can always see what the other members of the team make with this sketch by clicking on the logo on my side bar. They are so creative and always have good stuff to share. Other: bling--lots of rhinestones, new embossing folder from sizzix, nestabilities, sticky strip, glass glitterTasteful Trim die. TGIF! I love Friday hope you have a good one. 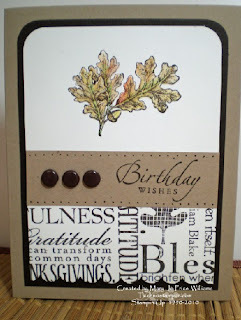 This is also for the challenge on Latenightstampers to create projects with a Thanksgiving or Thank You theme. Thanks so much for stopping by--Have a great day! I think this is going to be a fun one! Can't wait to see what you come up with. Remember to come on back here and add you link below after you make your sample. I am struggling with how to post this this week. Due to the Royal Blog Tour I am not supposed to post anything on my blog until it was over. I thought it was over tonight so I would just be a bit late but it is not over until Monday night so I am posting this below that post. Hope you find it--I guess if you are reading it you did find it and if you are not--than I guess you did not, lol! Here are my top three picks for this week! 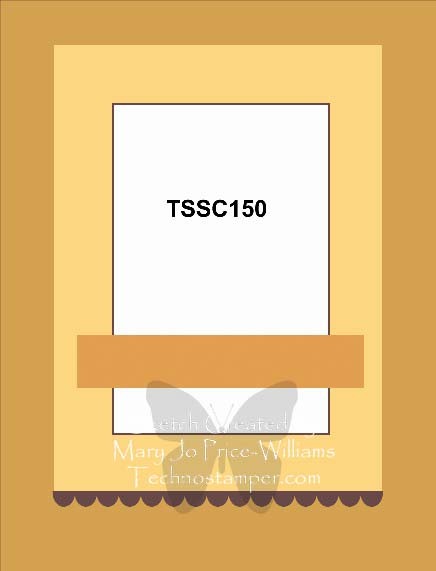 Remember that you can click on the card and you will be brought to the creator's blog post where you will be able to view the entire card and leave a kind message! Awesome samples ladies. Feel free to add my top three winner badge to your blogs. Welcome to my castle. I hope you are feeling like a Royalty while you follow the path from castle to castle. I am excited to share some beautiful samples with the Hostess Set Cute by the Inch. I did not think I would like this set when I seen it but I am so glad I got it. I have done so many projects with it and I love them all. This has been a fun set to use for Scrapbooking, cards and home decor. 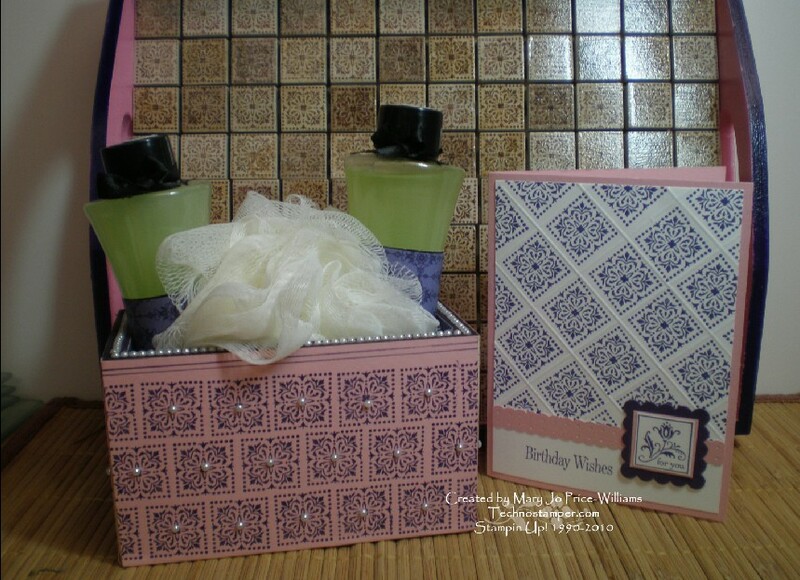 I will start my samples off with a birthday gift set. 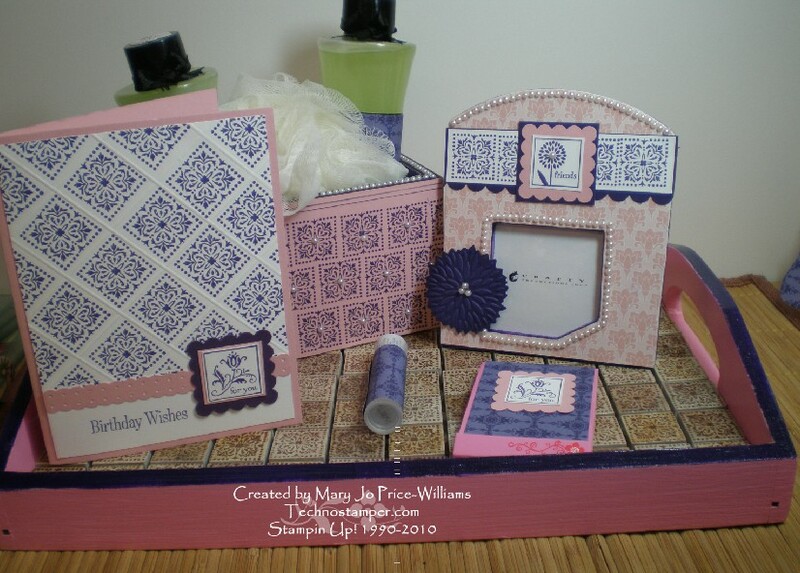 The gift set consists of a card, a tray with stamped tile added, a decorated box with bubble bath, a photo frame, chap stick and nail files all done in a Concord Grape, Blushing Bride color scheme. 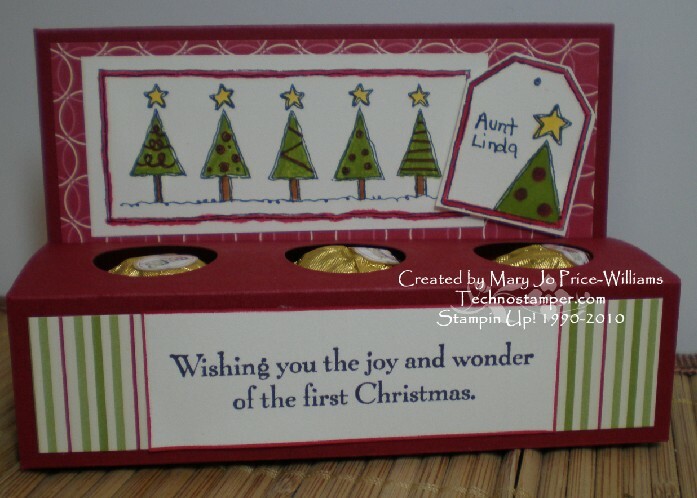 I really want to add pearls to the top edges of the tray to match the box but I did not have enough so next order I will be adding those to finish it off. Here is a group picture. 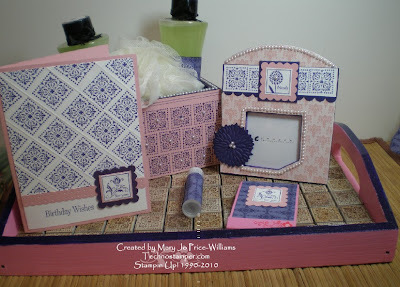 All of the items included with this gift set were items that have been sitting in my Royal Studio for two or more years just waiting to be transformed! Here is a shot of the card, box with bubble bath and the inside of the tray. Each tile is stamped and then I covered them all with modge podge so that it would protect it from water and such. 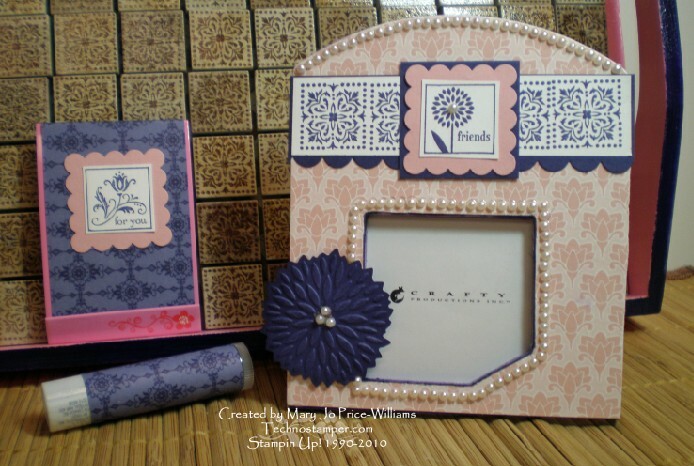 And here is a close up of the frame, chap stick, nail files and another shot of the tray. I was very happy with how this frame turned out. The frame was only twenty five cents and now it looks so pretty--don't you think. I love that we can use our stamps for so much more than just card making. 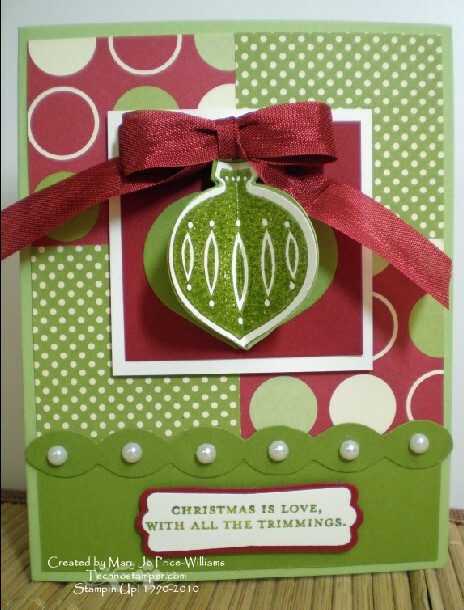 But speaking of card making. 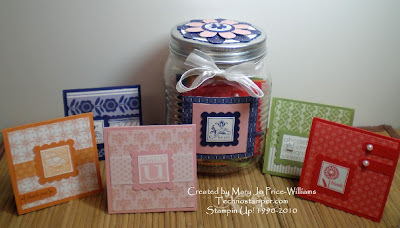 I decided to go one more step and create a Jar of Cards. I used the same color scheme on the exterior of the jar, but each three by three card is done if a different in color. There are two of each card with matching envelopes in the jar. And since I am allowed six photos on my post as per the QUEEN and her Royal Crew I will show you a few more card ideas with this set. 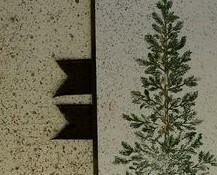 I had to combine them into two pictures so they are kind of small but hopefully you get the idea. If you have any questions please do not hesitate to ask--but be sure to leave me your e-mail since blogger doesn't always show them. I do not want to take up too much of your time, I know you are on a journey and I am sure you want to move on. If you enjoyed my blog please take a moment to bookmark it so you can come back again after the tour is over. Hope you have a wonderful time--see ya soon! 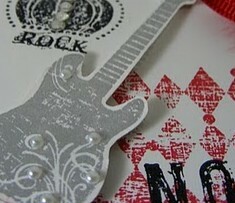 Clue number 5 for the Royal Blog Tour Big Give Away game. Sorry for the delay on this, my camera took longer than I thought to dry out and decide it still wanted to work. I am ecstatic as I can't afford to buy a new one right before Christmas. 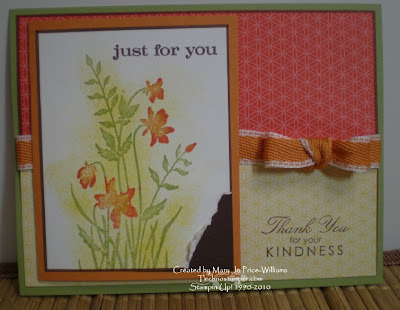 So without further delay, here is my card for both My sketch challenge 146 for this week --you can find the original post HERE- and for this week's Latenightstamper challenge to create gift card holders. If you don't belong to this group you are missing some awesome samples! Here is my card, it is not a full card, it is more of a card front with a mini card on top. Easy and fun. 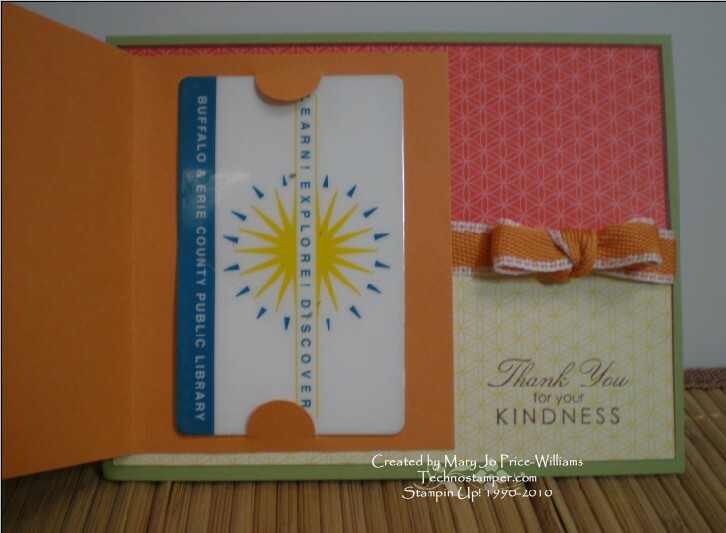 Here is a picture of the gift card holder part open. 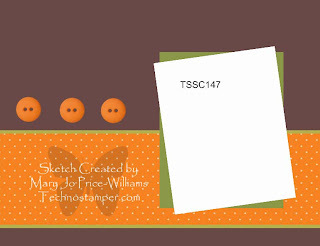 I hope you will play along with my sketch challenge this week. Again you can find it HERE. Hope your having a super duper week! Whoops, forgot to post yesterdays, my son got sick at school and my whole day changed, lol.